This is the demo for Mister Pit. 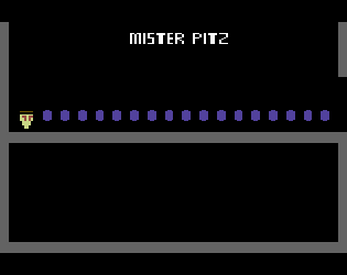 Mister Pitz is a platformer shooter hybrid made to look like a Commodore 64 game. In the game, Mister Pitz is a pizza slice who doesn't have any legs or feet. So he has to hop his way though several challenging levels in order to get the thing he needs to grow his own legs and feet - growth cookies! I hope you enjoy the demo for Mister Pitz by JH Games! The gameplay needs to improve, you can only move the jump, and when the ground gets hitched, is tedious. Well, this is an early demo so there is plenty of room for improvement. I will definitely try to fix that problem you mentioned with the ground. Also, the recent why you can only jump in the game is because Mister Pitz doesn't have legs.